Please leave your shoes at the door. There are as many ways to walk the Camino as there are Peregrinos. Each person has a different purpose for doing the walk, a different time frame, a different financial situation. Some people walk alone, some walk with a partner, some walk in groups. Some arrive in St Jean Pied de Port with a backpack and only a rough idea of what is ahead of them, and others hire tour companies to carry their bags and arrange 4-5 star hotels all along the way. The possibilities are limitless. There is no ‘right way’ – as the guidebooks say – you must “walk your own Camino”. And just as there is no one right kind of Peregrino, there is no one right kind of accommodation. Some albergues may offer private rooms, but most have single beds or bunk beds in a a large, dorm-style room. 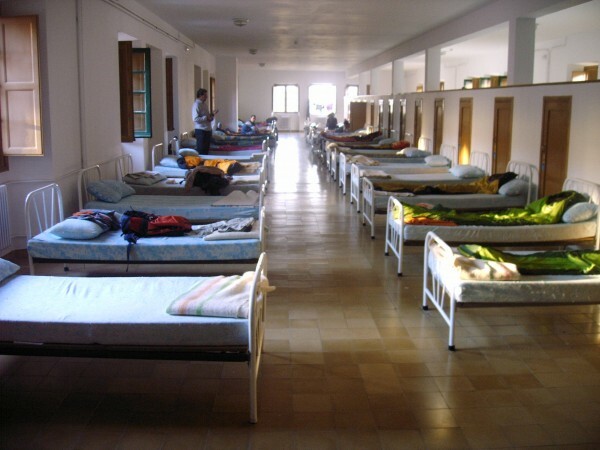 The most traditional, and least expensive bed to sleep in each night can be found in the albergues or refugios (called an Auberge or Refuge in France). They are basically hostels with dorm style sleeping arrangements, usually bunk beds in close quarters in a large room with shared bathroom facilities. Most have sinks for doing laundry and some have kitchens or additional amenities such as wifi or computers. The prices range from a suggested donation to 15 euros per person. With the exception of the private albergues, most are filled on a first-come-first-served basis and have strict opening and closing hours. Generally only Peregrinos are allowed to stay here, and even then, for only one night. In most cases, it’s lights out (doors locked) at 10pm and you are expected to vacate by 8am. Municipal albergues are usually the least expensive, and from what I’ve read, can be quite inconsistent. Some are wonderful and others, not so much. It’s probably a good idea to read reviews of municipal albergues before staying in them. Religious albergues are operated by churches, monasteries, or convents. They often charge by donation or a small fee. They may not offer many amenities but the volunteers who run them tend to be quite caring. You do not have to belong to the church to stay here. Some albergues are run by camino associations and the volunteers who run them have often done the camino themselves. They often charge by donation as well. In addition, there are privately run albergues. They tend to have more amenities (kitchens, laundry facilities, some private rooms, wifi etc). There is generally a higher charge for these facilities. These offer rooms in privately run B&Bs, some with private, but most with shared bath. Most offer breakfast and there can be a range of amenities and prices. 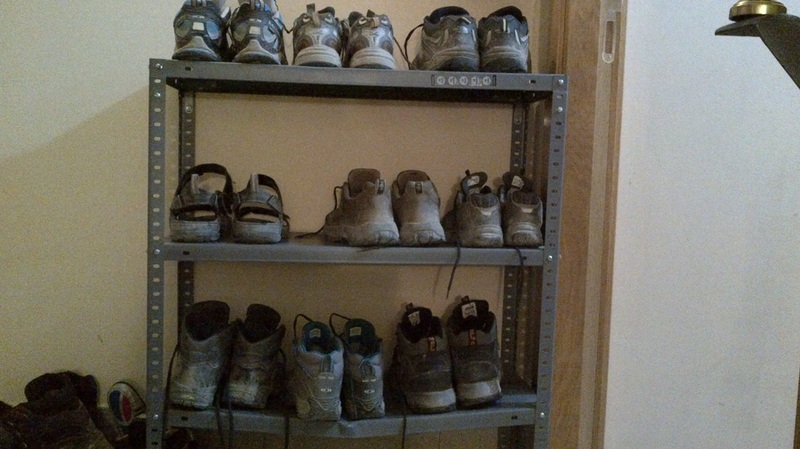 They are usually a step up from an albergue. They can often be booked ahead. There are a wide variety of 2-5 star hotels along the Camino, particularly in the larger towns and cities. Most can be booked ahead and like most hotels, they have a wide range of amenities, prices, and quality. 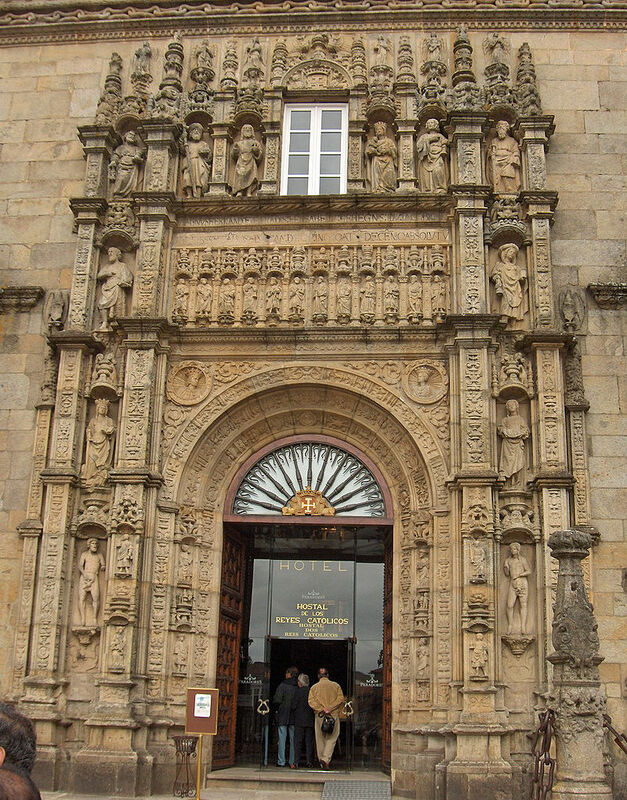 Entrance to the Parador in Santiago de Compostella. These are private B&Bs that are found in rural areas, frequently a working family farm supplementing their income. Like pensiones, they range in quality, amenities, and price. We have done quite a bit of travelling, including self-supported cycle tours in France and hiking part of the Cotswold Way in the UK last summer, so we have a reasonable idea of what to expect when carrying a backpack for 20-30 km per day. Because developing the camaraderie of our fellow pilgrims is so important to us, we intend on staying in the albergues at least a third of the time, maybe even more. There will be times when a hostel is the only option, and there are a few hostels that come highly recommended so we hope to track those ones down for sure. Other times, we intend to sample some of the other kinds of accommodation listed above. Here are some of the reasons why we don’t think we will stay in albergues every night. * We don’t want to have the pressure of getting to the next town as quickly as possible to ensure we find a bed at the albergue. We want to take our time and enjoy the trip, without worrying too much about where we still sleep that night. * We both find we need a really good (quiet) sleep and appreciate our privacy (at least some of the time). * We are not on a super-tight budget and can afford hotels once in awhile. * We are interested in staying with Spanish families in small B&Bs and Casa Rurales. Of course, we really don’t know how things will turn out. We recognize that the Camino can be a life-changing experience and we are ready and willing to adjust our plans along the way. If you’ve done the Camino, feel free to comment about your own experiences below!